The basket full of kisses episode! Ostensibly, The Best of Everything, read in bed, makes its appearance as work homework. However, fifty years later, the personal and professional struggles women face in the city remain the same. I dare you to work on Madison Avenue and read this trashy bestseller today. Dated as it may be, you will still ride the train to work with your head in your hands. And Rachel Menken. Don really never gets it right after you. Exodus is part of research done to make a client out of the Israeli Tourism Bureau. 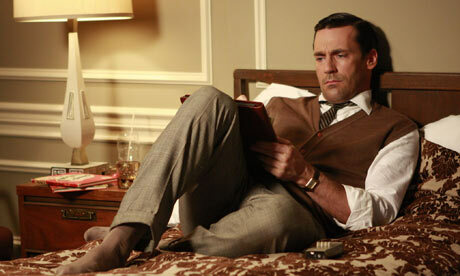 However, it may as well remain under Don's pillow for the rest of the series as character shorthand. A book about a people in search of a homeland? Independence? Rebirth? Signifier: check. "I am the least difficult of men. All I want is boundless love." Drinking lunch in a bar, Don notices a fellow patron reading Frank O'Hara. Don asks about the book; he replies, "I don't think you'd like it." This is a hilarious thing to say. Sally Draper reads aloud from this to Grandpa Gene, as the world around them changes, starting at home. It's an important scene, starting an arc where he steps in as her parent(s), trying to mitigate the damage of neglect. Of course, it also foreshadows the cultural shift that is coming for all the characters. Remember when Betty Draper shot some birds? Remember when she slapped Helen Bishop at the supermarket? Remember when she had her moments? Everybody hates Betty Draper now, which given the trajectory of her character in the last season, is understandable. Still, this is the book that she reads in the bath and at the table before the seismic shift of the locked box. And this is after the post-partum nightmare where Gene tells her, "You're a housecat. Very important, with little to do." I am holding out hope, along with others, that this is a stretching exercise for The Feminine Mystique. Also, seriously? Get out of Reno. Haven't you seen The Misfits? Honorable mention: Bertram Cooper talking about Ayn Rand. Every television show should have a character that does this because then television would more accurately depict the world. I am, wherever I go, forever approached by a person pressing in, instructing me to read Atlas Shrugged. I love this series. Thanks for the info on when it starts again.